Since the year 2000 water technology has been the economic priority of the province of Frys-lân. The aim is to become European water technology hub based on excellence knowledge that provides an economic boost to the region. 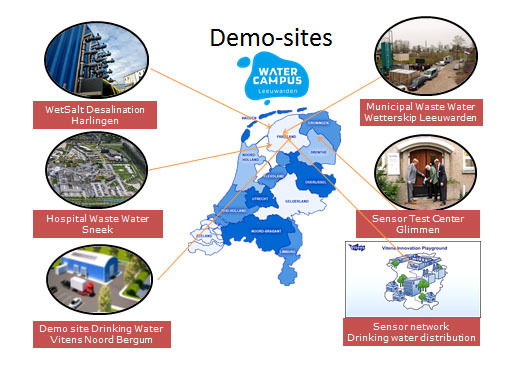 At the start meeting of SW4EU, December 2013, in Leeuwarden I have enlightened our strategy, the facilities of the WaterCampus and the results so far in a presentation. The Vitens Innovation Playground and the participation of Vitens in a project as SW4EU is completely in line with that strategy. It is however interesting to unfold that before becoming a leadpartner in a €12 mln EU project a preparation period of 2 years has taken place with support of the province of Fryslân. One of the policy instruments the province of Fryslân has used to reach the goal is the sub-sidy scheme “Fryslân Fernyt”. Consortia could apply for grants (max. 50%) for innovative projects in the field of water technology. May 2011 Vitens formed a consortium together with SME’s Aqua-Explorer and Optiqua and Van Hall Larenstein, an university of applied science. They wrote together a project proposal for a pilot with a smart distribution grid with a total cost of €500.000. 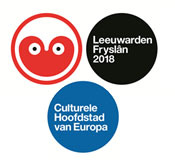 The province of Fryslân supplied a grant of €200.000. The smart grid pilot in Fryslân caused a strategic discussion within the board of Vitens whether pilots in the distribution area of Vitens should be concentrated or not. Outcome: they should. De board of Vitens decided to designate an area in the North Eastern part of Fryslan as playground and show-case region for intelligent water supply and distribution called Vitens Innovation Playground (VIP). In this distribution network of 2.000 km – a unique scale – advanced sensors can provide real time insight in water quality and water volume parameters and new technology can be tested. 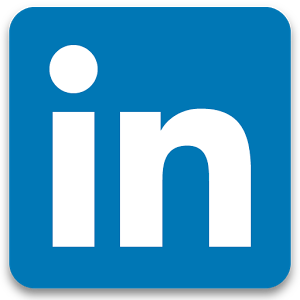 Additional investment of Vitens: ca. € 1 mln. 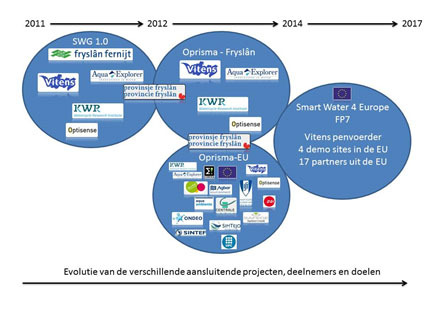 In July 2012 a consortium with Vitens, Optiqua, Aqua Explorer and KWR was able to join he EU-project PRISMA with their activities in the VIP. The volume of the project was ca € 1,5 mln and was co-financed via regional subsidy schemes (€ 450.000). In March 2013 the VIP was rewarded with a Global Innovation Award at the Water and Ener-gy Exchange in Madrid. In October 2013 the proposal SW4EU was rewarded with € 12 mln in the KP7-programme after severe competition. In April 2014 this project was rewarded as ‘Water performance initi-ative of the year 2014’ at the Global Water Summit in Paris. Evolution of SW4EU out of other projects. The experiments in the VIP that Vitens could execute with support of the mentioned grants have been very successful. August 2014 the board of Vitens decided to speed up the imple-mentation of smart sensoring in their network starting in the province of Fryslân with the pro-ject Fryslân Live. It will lead to considerable investments in our province, which is a nice spin-off of our policy. So far the VIP and SW4EU from the perspective of a regional authority. 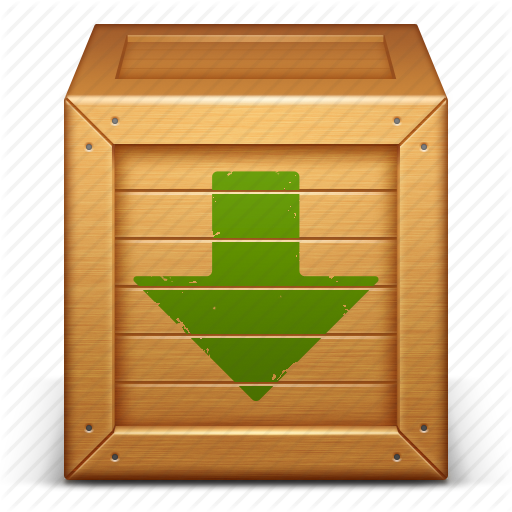 I have tried to show you how very are involved in the preparations and spin-offs. The province of Fryslân would be happy to host of the slot conference of SW4EU in 2017 and show you the results and the spin-offs of the VIP and other interesting show cases and projects in our test garden.